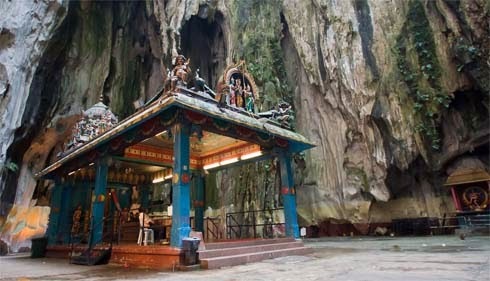 Batu Caves is one of the holiest places associated with Hindus in Malaysia. The biggest of the caves here houses a temple dedicated to Lord Muruga or Kartikeya or Subrahmanya, the general of the Devas and the eldest son of Lord Shiva. Thaipusam 2019 date at Batu Caves is 2019 date is January 21. The most important festival at Batu Caves is the Thaipusam festival in January which attracts nearly a million visitors from Malaysia, India, Singapore and other parts of the world. One of the Sanskrit words for cave is ‘guha’ and one of the names of Lord Muruga is also Guha since he likes to live in caves. As one approach the foot of the cave one can see a towering statue of Lord Muruga holding a ‘Vel.’ There are numerous small shrines at the foot of the hill. 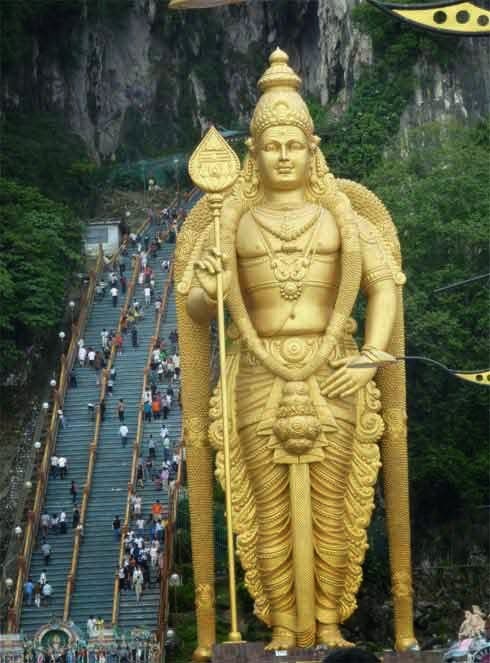 One has to climb 272 steps to reach the Lord Muruga shrine in the cave. Batu Caves is around 15 km north of Kuala Lumpur. The cave is dominated by stalactites and stalagmites and water drips from the roof. There Subrahmanya Swami Temple (kovil) inside the cave and there is also a lovely figure of Bala Muruga and several other statues. On the Thaipusam day, the air reverberates with the chants of Vel, Vel, Shakti Vel and thousands of devotees carry kavadi, symbolizing the mountain lifted by Idumban. People start carrying the Kavadi from early morning on Thaipusam day. Women devotees carry the pal kudam (milk pots) and couples who had their wish for offspring fulfilled carry their babes in cradles supported by sugarcane sticks. The procession to the Batu Caves also includes people who pierce their tongues and cheeks with Vels of different sizes and people who pull chariots with hooks pierced to their skin. All forms of Kavadis and other offerings performed on the day are to the fulfillment of vows for wishes granted and others for getting their wishes fulfilled by Lord Muruga. In Malaysia, Thaipusam is also observed at the Nattukottai Chettiar Temple and the Arulmigu Balathandayuthapani Hilltop Temple in Penang, Johor Baru Sri Dhandayuthapani Temple, Sri Subramaniar Temple in Gunung Cheroh and in Buntong Sri Subramaniar Temple. Sadly, the Thaipusam festival is reported and noted around the world for body piercing and pulling of chariots with hooks attached to the body. Majority of the non-hindu crowd assembles to see this piercing. The symbolic element associated with the festival is forgotten.